A way to generate a strong turbulence in a small size experiment in a laboratory is the so called von Karman flow: water is stirred by counter-rotating turbines. 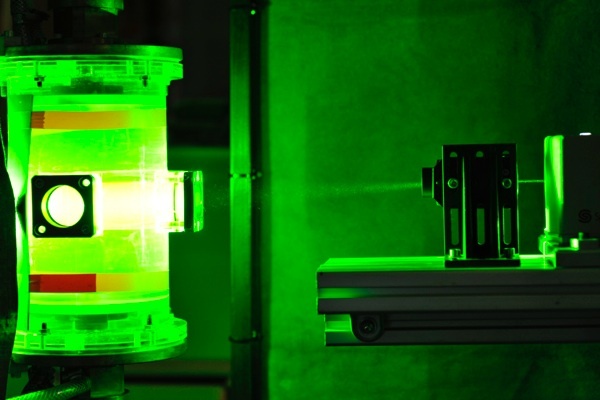 On the picture on the right the turbines can be seen on top and bottom of the green cylinder (green light comes from a YAG laser). The turbines are moved by two motors at the very top and bottom. This configuration has been used a lot for fundamental studies of 3D turbulence specifically for Lagrangian studies because this flow is very turbulent (much more than a wind tunnel in air) and it is a closed flow. This flow has also been used for MHD and dynamo studies (see MHD section). For Lagrangian studies, we mark individual fluid particles by using small solid fluorescent polystyrene particles. We can then measure the trajectories in 2D or 3D by using a set of high speed cameras. In the vicinity of the center of the flow, the turbulence can be considered (to some extent...) to quite close to homogeneous (although obviously there is a stagnation point). Lagrangian statistics in inhomogeneous turbulent flows. 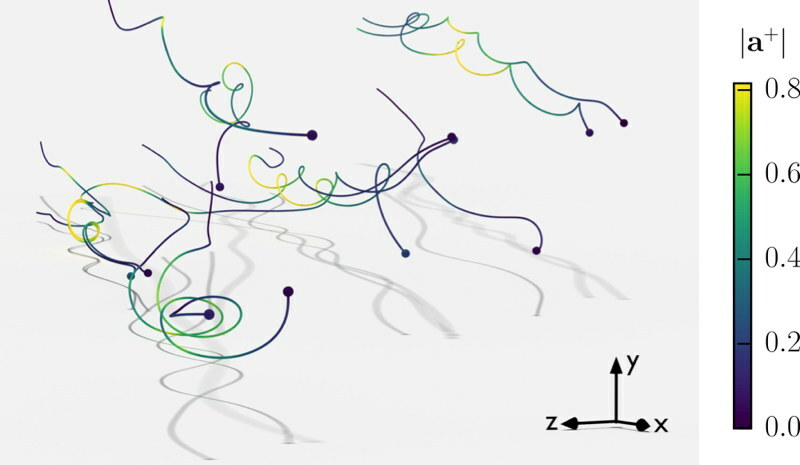 Although the study of the statistical properties of particle dispersion in homogeneous turbulence led to exciting new results, real flows can rarely be considered as homogeneous due to average flow (shear) and confinement by walls. Therefore we are now studying canonical inhomogeneous, anisotropic flows: the turbulent jet and the turbulent channel flow. In such flows, the statistical analysis is made much more complex by the inhomogeneity as all statistics have to be conditioned on the position. This requires to take much bigger datasets. The planar turbulent channel flow is a canonical flow that is confined but still retains many symmetries. The parametrisation of the inhomogeneity requires only to conditioned on a single scalar parameter: the distance to the wall. We developed an experiment in water. I. Vinkovic and J.I. Polanco in Université Lyon 1 performed pseudo-spectral direct numerical simulation at the same Reynolds number (Re_tau=1400) that allowed us to have direct comparison between experiment and DNS. The image below shows a few trajectories from the DNS. The x-axis is streamwise and the y-axis is normal to the walls. The shadows are projected onto the wall. The color reproduce the acceleration. The turbulent jet is a canonical flow for free shear flows. Our first experiments were using in air as the fluid. Performing particle tracking in air is challenging due to the difficulty to mark fluid particles. In, LEGI, C. Baudet and M. Bourgoin used soap bubbles inflated with Helium to match the density of air. 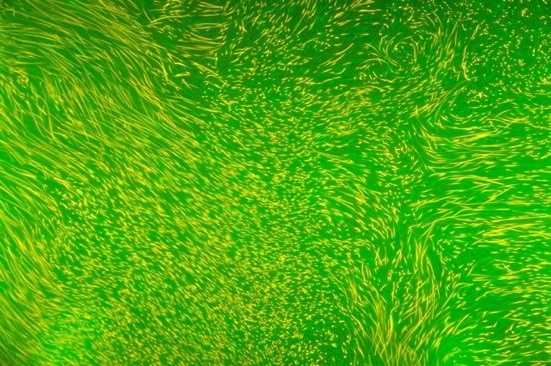 The movie below show the soap bubbles entrained in a turbulent jet. The jet comes from the back of the movie. The light of the projector is reflected twice on each particle and the color comes from the thickness of the soap wall. 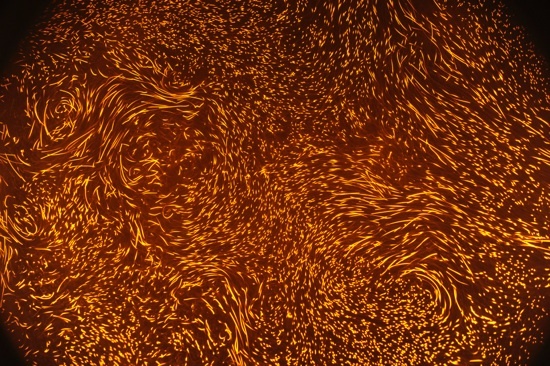 Close up picture of the flow seeded by 10 micron fluorescent particles (rhodamine) excited by a YAG laser sheet. 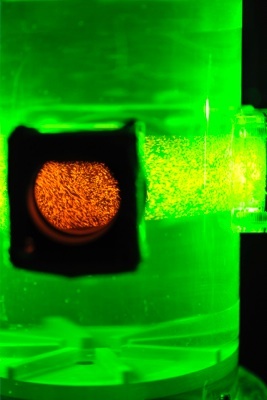 Picture of 10 micron fluorescent particles (rhodamine) excited by a YAG laser sheet, in the flow above. View through the window. No colored filter has been used here as opposed to the picture below. The field of view is about 2 cm which corresponds roughly to the integral scale of the flow. The exposure time is 1/250 s.